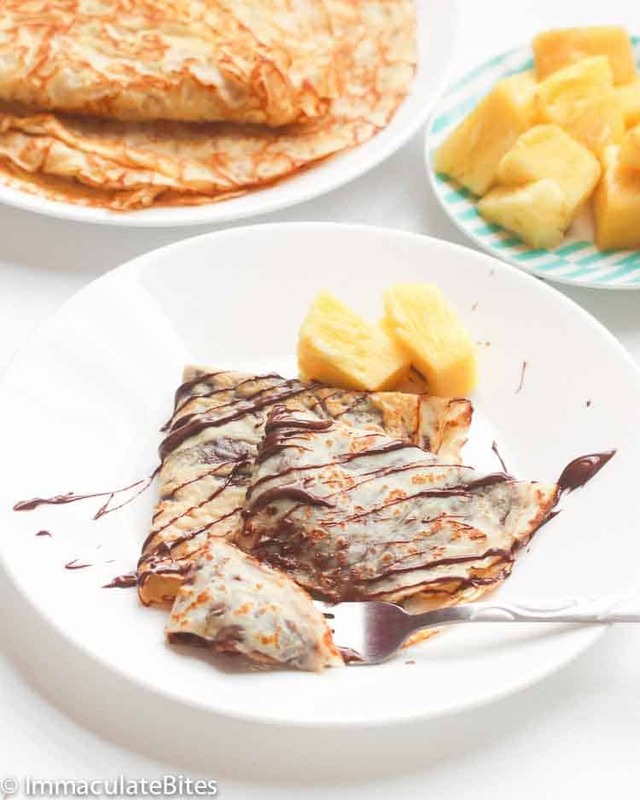 Easy Crepe Recipe – Light, tender and slightly sweet crepes that makes for a fancy breakfast filled with your favorite fresh fruit, Nutella or dusted off with powdered sugar and a whipped cream on the side. 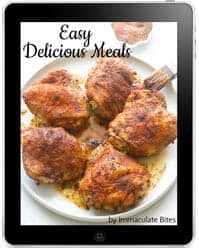 Simply, easy, tasty and fancy! PERFECT for Mothers day breakfast in bed. Bonjours Mes Amis!!! How about some crepes? Oui ? There’s something really comforting about pancakes and/or crepes . Here in our house, we never skip a week without some sort of pancakes; they are my son’s favorite. 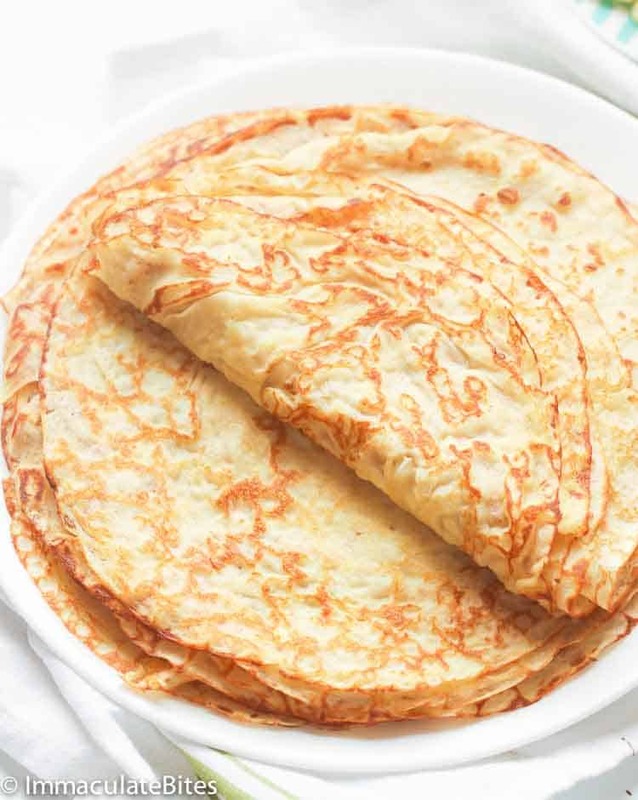 I’d alternatively serve him with these African Style Pancakes or these thick and Fluffy Pancakes. Not a tiny trace of pancake would be seen on his plate. He’s obviously obsessed with it! 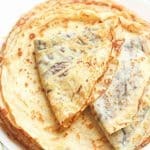 These French version of pancakes are thin and delicate. Crepes bring so much memories while growing up. I was raised in a French colonized country, hence the love of crepes. It wasn’t like a breakfast thing …. more of an afternoon snack or dessert. If you are throwing a mother’s day brunch this should be on your menu. It’s easier to fill them up and fold. You can choose whatever you want to go with it. You can make them savory, fill it with sunny-side up egg, spinach, ham, cheese and even bacon. Or if you have a sweet tooth craving like me , you can fill it with nutella, jam, strawberries, bananas, whipped cream- your call. The possibilities are ENDLESS! The chocolate filled ones , I made in my hometown Yaounde , Cameroon. Oh yes, everyone wants me to make these for them, even when I travel. Couldn’t find strawberries .- So made it with chocolate and pineapple on the side . Am a tropical girl and love pineapples . The ones with strawberries and whipped cream came out of my Los Angeles Kitchen. All are quite tasty. Perfect for Mother’s Day in bed. 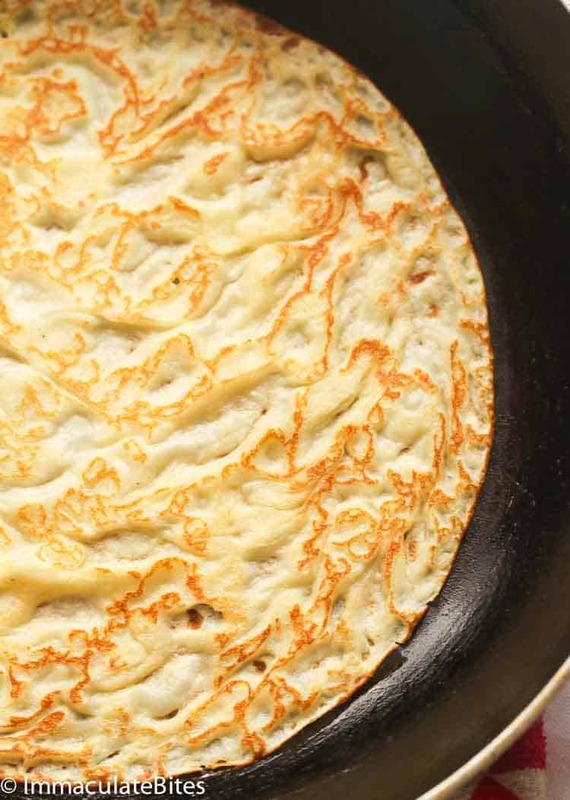 While pancake batter is a little thicker and richer, crepe batter is thin and smooth. Thanks to our handy helper blender for making it possible. Although you can just whisk it vigorously in a bowl, crepes mixed in blender is best for a lump-free batter. And you can simply use the blender to store the batter in the fridge and pour from it when ready to cook, which brings us to the next tip in crepe-making – resting the batter. For the most part , I don’t do it . 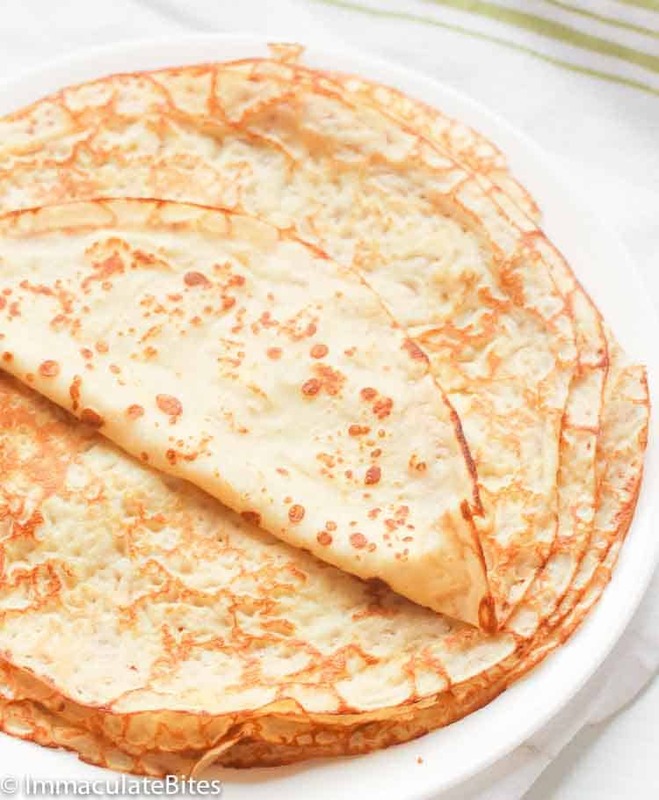 So if you are just like me , you can skip the resting stage- Letting the batter rest for an hour or overnight in the fridge helps to achieve a smooth, light and airy crepe that wouldn’t tear off easily when cooked and folded. This would be perfect if you are cooking for a crowd , I make it the night of the event , let it rest in the fridge and fry the next day. Tilting the pan so the batter can spread easily across the hot pan also creates a paper-thin smooth that crepes are known for. Make sure to cook it on a hot pan with a cooking oil or spray, but I prefer melted butter ’cause it adds a hint of buttery flavor. Now you know how to whip up some batch of crepe, all you get to decide is how to fill it in. I guess, that’s the hardest part. But hey, why not serve them up in a variety of filling. That’ll do the trick. 😉 Go ahead and channel the inner French cook in you. This crepe here is the sweet version. If you want to have a savory crepe, omit sugar and vanilla and add the batter with a 1/4 teaspoon of salt, depending on your preference. Let the crepe batter sit in the fridge for an hour or overnight to relax the gluten and ensures a smooth light and airy crepes. Make sure to use a pan with thick bottom so it’ll heat evenly. Start by slowly heating the pan to the desired temp. Before pouring the batter, make sure the pan is hot enough, otherwise your crepe will end up sticking to the pan. Don’t flip the crepe too early. Wait til the bottom is light brown and the edges are starting to brown. 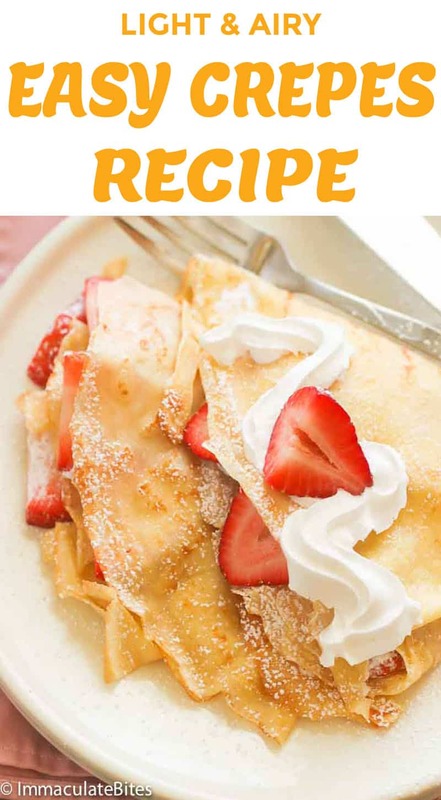 This recipes makes around 6-8 crepes depending on what size of pan you use. 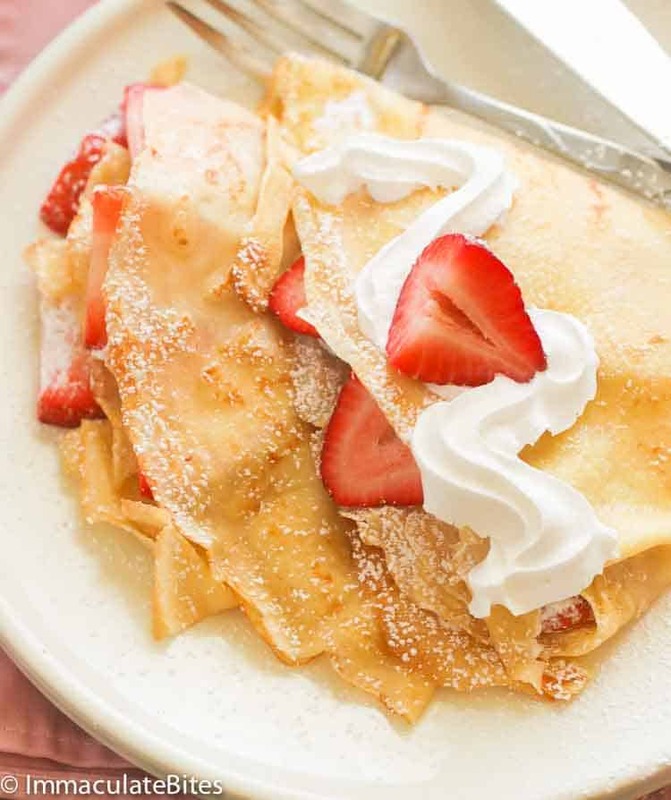 For sweet crepes, you can fill it with Nutella, fresh fruit, jam and top it with whipped cream or powdered sugar. For savory crepes (see note 1), you may fill it with ham, cheese, bacon, egg, spinach or whatever suites to your liking. In a blender, mix in eggs, milk, vanilla, sugar ,salt , water , flour and butter . Let the batter rest for about an hour or more in the refrigerator or overnight. Heat a skillet over medium high heat, then lightly coat the hot pan with vegetable oil, cooking spray, or clarified butter. Pour about a ⅓ cup of batter, depending on your fry pan or skillet. Tilt pan so the batter spreads across the bottom of the pan. 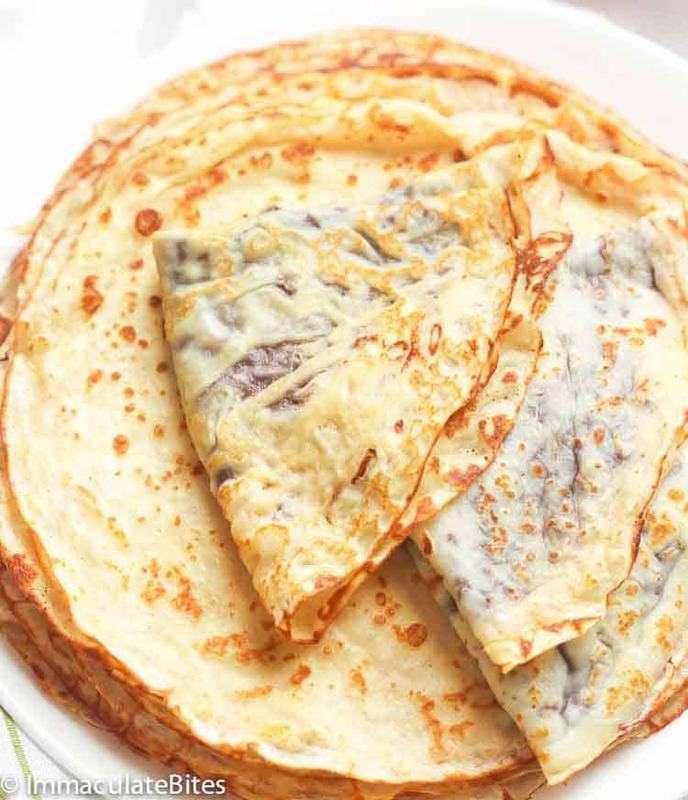 Cook the crepe for about 1 ½ minute, until the bottom is light brown. Lift with a spatula, turn and cook the other side. 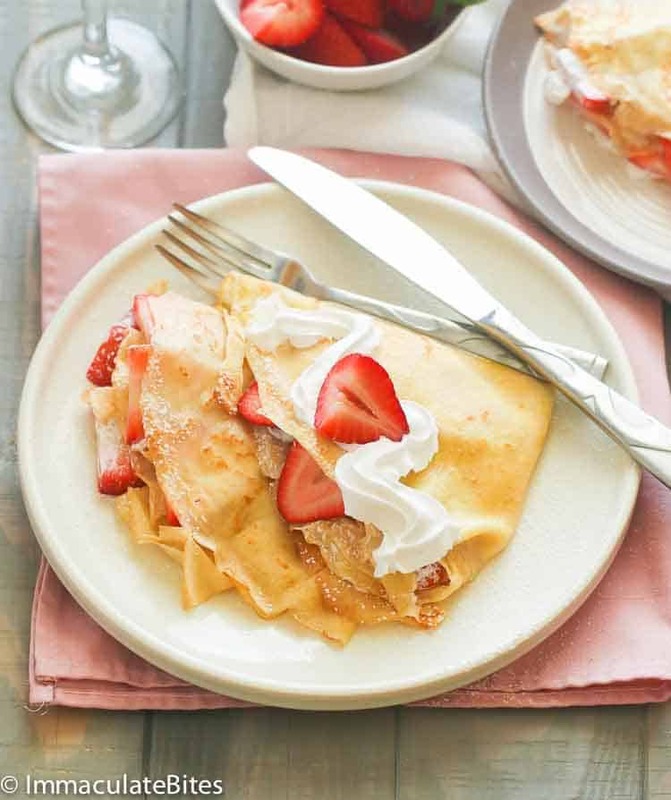 Serve crêpes warm with fresh fruit, whipped cream and powdered sugar. Okay this was the best crepe recipe I have ever encountered. Thank you!!!!! Yaaay! Thank you for the glowing feedback. Glad it turned out well for you. Love me some crepe. I used liquid peak milk and prestige unsalted butter…. the result was just what I wanted. Thanks so much for the tips. I’m so happy it turned out well for you. Thank you for taking the time to let me know. Thank you for this recipe. My daughter requested it for her birthday and they recipe turned out perfect and was easy to make. They tested delicious. Belated happy birthday to your daughter, Jenny! Glad you all liked it. Absolutely delicious!! Your recipe was on target and very closely characterizes my grandmother’s (who was raised in a community of French settlers in Louisiana. This is a keeper for breakfast with family and friends. How long does batter keep for? Mine usually last up to 24 hours, without an after taste. My family is from Kilsborg, Sweden so we grew up eating Swedish pancakes, your recipe is indentically like ours, tender, sweet and just the right texture. This is right on!…we top with powdered sugar and lingonberry jam. Awesome! Thank you so much for letting me know, Carl! Thank your for stopping by, Patrick! Thank you for your super ideas – great to eat at any time – always such a treat!